One of the most apparent proofs of the value of land conservation is the return and resurgence of the American black bear (Ursus americanus) in Southern New England. The black bear is a forest dweller and a keystone species that exerts a strong influence on its habitat. As our forests begin to mature, excellent black bear habitat is being created, and they are filling this new niche. They are fascinating and gentle creatures and we are fortunate to have them living in the woods around us. Black bears are omnivorous but their diet consists of about 80% plant material and varies across the seasons according to what is available to browse. They eat grasses, berries, acorns, and beechnuts and will also consume carrion and insects including bee larvae. They serve a strong role in the dispersal of plant seeds across the landscape. Bears have been known to opportunistically prey on deer fawns and small farm animals. What they do love, however, is garbage and bird seed, and once they find such an easy source of rich reward, they become habituated to such foods in the places where they have discovered them. Black bear cubs are born in the winter, weighing less than a pound at birth. Their mother nurtures them quite intimately for the first two years or more of their lives and she provides them with food, defense, and the knowledge that they need to survive on their own. They help their mother build their first wintering den, learning how the den is constructed so that they can do it themselves when they get older. The cubs continue to learn the way of the bear until their second year, when their mother disperses them so that she can raise another set of cubs. She continues to recognize her own offspring and tolerates them living in part of her range so that they are not forced into conflict with other, non-related bears. In fact, she will challenge other bears that could compete with her offspring even after they leave her direct care. Thus we see the critical role that mother bears play in the entire lifespan of their offspring. Bears will not endlessly reproduce. Habitat and resource availability both exert strong influences on bear population size and determine the carrying capacity of the land. Social interactions and conflicts between bears also limit them. Bears have evolved with these controls that have made them a successful inhabitant of this landscape. CT DEEP wants her dead. Do you? When bear cubs are deprived of their mothers during their formative first two years of life, they do not gain the knowledge necessary to survive and often meet an unkind end. In particular, their untrained search for food can lead them into direct conflict with humans – these are often the chronic garbage and bird-feeder raiders. Once such a reward is imprinted in them, they will repeatedly return to the place of the reward until they realize that there is no prize for their effort. So to live in harmony with bears, we need to understand the way of the bear. And that means don’t leave your garbage out and don’t feed the birds (they don’t need our help, by the way). If you have farm animals or keep bees, use an electric fence to exclude them. No rewards, no bears. Black bears generally do not present a risk to humans. They have the best nose in the woods and they deliberately avoid us. A recent study by the New York Department of Environmental Conservation showed only a few significant bear-human interactions across over 10 million recreation days in the Adirondacks, the epicenter of the bear population in the state. Virtually all ADK backcountry users engage in practices that minimize their attraction to bears (typ. food management). 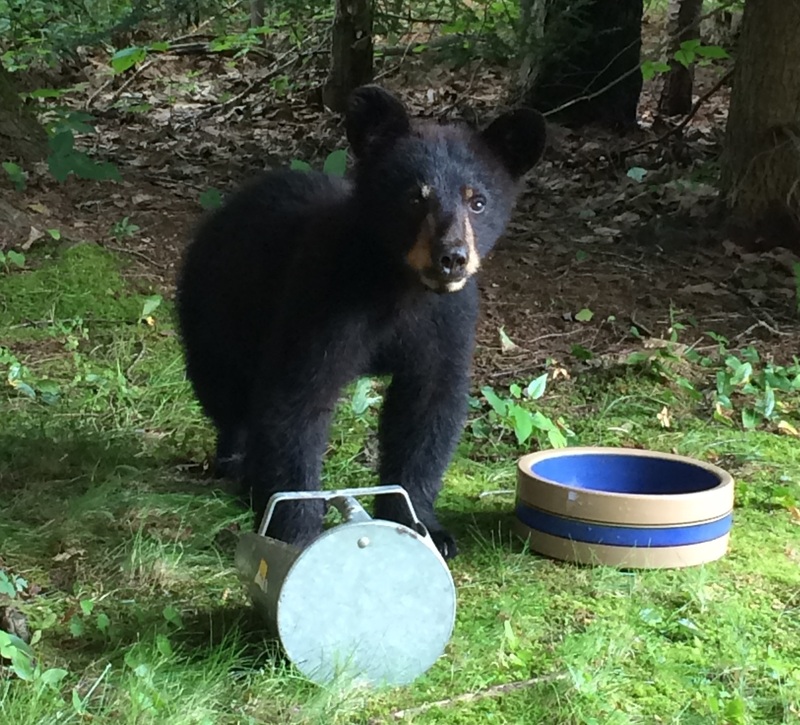 Most people who frequent the backcountry in Northwestern Connecticut will never see a bear. But leave your garbage out and the likelihood of encountering one rises significantly. Stringham and Rogers also challenge the idea that hunting bears makes bears fearful of humans and more likely to exhibit anthropophobia. They found that in bear hunting country, black bears will often differentially seek refuge with humans who protect them. They cite evidence of bears aggregating at a northern Minnesota research station, at Adirondack dumps, and at private residences where bears are altruistically and regularly fed specifically during the height of the killing season. As with all creatures, they are learning where it is safe to live and where it is unsafe to live. Thus, it is reasonable to suggest that rural bear hunting may increase the incidence of bear incursion into the suburbs, the very place with the loudest voices demanding the killing of bears. If you do encounter a bear, the most important thing to remember is to leave them an escape route. Cornering one is a sure way to make your day a memorable one. Making noise by yelling or banging pots together while facing the bear and backing away slowly will generally make them leave. You can also keep handy a pepper spray designed to repel bears, if you are so inclined. When you’re in bear habitat, walk with eyes up so that you never get close. That’s good for you and good for the bear. People who live in the rural world can live in harmony with the black bear. They do not have to be hunted and killed to keep us safe or to control their populations. Bear hunting is a particularly horrifying activity that is intensively ruthless. The State of Connecticut DEEP, a consistent advocate of blood sport primarily because of its revenue value and the skewing of its science staff toward killers, is advocating for a bear season that would allow the use of dogs to chase them and the shooting of bears over bait, with the bait (typically doughnuts) serving as an incentive to seek other human-produced foods. There is no scientific basis for this. Such activity creates a self-perpetuating loop wherein adults are killed, young animals are left to fend for themselves, they conflict with humans, and the call for more killing is advanced. CT DEEP and an ignorant citizenry want to import a uniquely human-generated horror into the forest. After centuries of local extirpation by hunting and by the destruction of their habitat, we need to stand up and defend these magnificent animals. The rural way of life is one of closeness to nature. Embrace it. CT DEEP captured and killed the bear cub in the photos in this post. Apparently neighbors called DEEP because she tangled with their beehives, and DEEP came out and killed her. 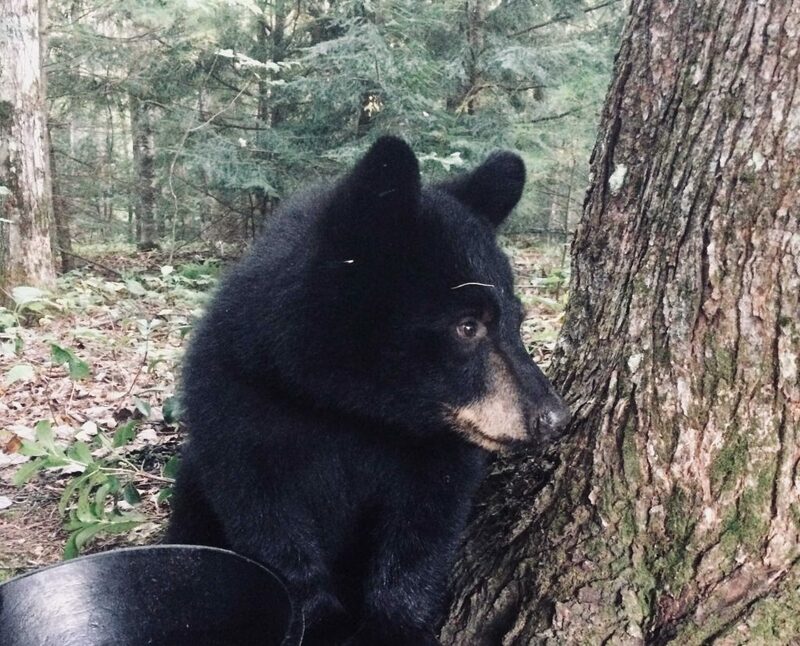 Absolutely outrageous, especially since the person who took these photographs tried to arrange for her to be sent to a NH bear rehab facility. CT DEEP’s Paul Rego and Jason Hawley said no even though there would be no cost to the State of CT. DEEP likely killed or translocated her mother, leaving her without a knowledge of the way of the bear. Now she is dead, too. DO NOT REPORT BEAR SIGHTINGS TO STATE WILDLIFE AGENCIES. DO NOT POST VIDEO/STILLS OF HUMAN-BEAR INTERACTIONS TO SOCIAL MEDIA. Such actions, your actions, lead to the deaths of wildlife. Image attribution: An anonymous bear lover in Connecticut. Latest update: 26 December 2018. Next articleThomas Merton on Happiness.